Many hypotheses have been floated after many, many years of work on what actually led to the collapse of Harappa, the largest Bronze Age Civilization and the earliest urban civilization that India has seen, some 5200 to 4500 years ago. Some said the invading Aryans destroyed it; others proposed that there were massive earthquakes which ruined the cities. Then there were some who suggested that rivers shifted course and left the cities on their banks to decay. Now, a group of researchers, from mathematicians to geologists to archaeologists, report today in Proceedings of the National Academy of Sciences, there’s conclusive evidence that it was climate change which led to the extinction of the Harappan civilization. “Our work shows that none of these is likely to be true. Rather, it was the shifting pattern of the monsoon, which receded towards the north and the east of the Indian continent which led to a drying up of the land in which the Harappans had made their civilisation, and this led to its collapse,” says Ronojoy Adhikari, a mathematician at The Institute of Mathematical Sciences in Chennai. Data analysis from multiples sources show that it was the gradual decrease in flood intensity that had encouraged urbanization around 4500 BC. However, further decline in monsoon precipitation made both inundation and rain-based farming difficult. 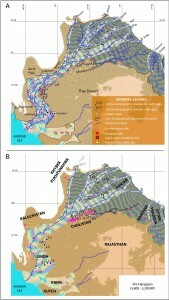 For a long while it was believed that a large glacier-fed Himalayan river, which some have identified as the “mythical Saraswati” river, watered the Harappan heartland. The new research shows that only monsoonal-fed rivers were active in those days. 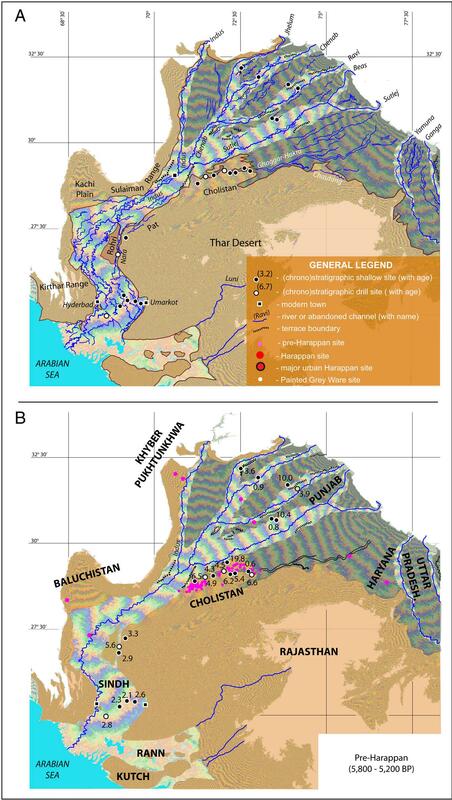 And as the monsoon weakened, these rivers dried or became seasonal, impacting “habitability” along their courses. Unlike the Egyptian and Mesopotamian civilizations, regions which were surrounded by deserts and hence restricted people’s movement forcing them to adapt and take action, harsh climate conditions led Harappan people to find an escape route. They moved eastwards, to the moister monsoon regions of upper Punjab, Haryana and Uttar Pradesh, says Liviu Giosan, a geologist at the Woods Hole Oceanographic Institution in Massachusetts. So, does this finding offer any lesson to the climate change skeptics? Of course it does, say both Adhikari and Giosan. society may have to find out innovative technological measures to deal with such a situation, and it is in this context, that we consider the findings in our paper a “lesson from the past”, they say. This result is “instructive”. As was the case in the Egyptian and Mesopotamian civilizations, people today hardly have any possibility to “move”. National borders and densely populated regions don’t provide the option of finding an escape route. Giosan, who researched inKarachi (unfortunately under protection) from 2003 to 2009, says the floods of 2010 inPakistan are a warning sign. “Monsoon is the life blood of India and other countries in the region but we don’t understand how it’s going to increase or decrease due to changing climate. The entire system of irrigation in this region is under calibrated,” he cautions. However, there’s one more reason why this study is important. This work brings in several independent sources of data – sediments, fluvial patterns and archaelogical records – to provide compelling support for the climate change hypothesis. “The great pioneer of such ‘combined methods’ was D. D. Kosambi [he wrote a popular book called ‘Combined Methods in Indology’] and I see our work as firmly embedded in that paradigm. This is the real strength of this work,” says Adhikari.